Shockingly, ex-Celtics guard Dennis Johnson collapsed at a practice of the NBA Developmental League team that he coaches and died yesterday at the age of 52. 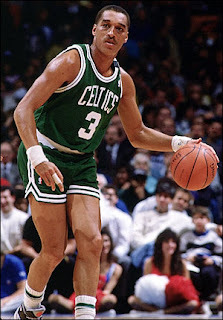 DJ was the point guard of the 1984 and 1986 champion Celtics and was one of the great defensive players of the time. Magic Johnson said that DJ was the toughest defensive player he ever played against. DJ was only 52, way too young. Our condolences to his family.